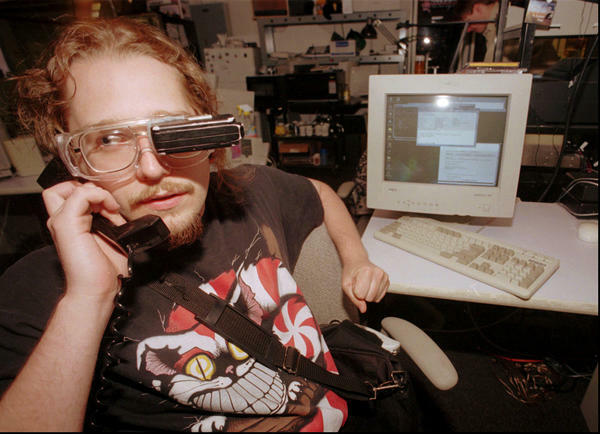 As a student at the Massachusetts Institute of Technology in 1997, Thad Starner developed — and wore, pretty much everywhere — a computer with a screen attached to goggles. The first person we hear from is actually a cyborg. His name is Thad Starner. In 1993, when Starner was in grad school, he went to see The Terminator. In the movie, Arnold Schwarzenegger's character views the world through a screen that's actually in his eyeball — sort of Google Glass before Google Glass came to be. Thad sees that and says, "That is cool!" So he works with a friend to create a computer he can wear. He jury-rigs a little screen to some goggles so he literally has a screen sitting in front of one eye. He has a wearable keyboard for one hand. He's constantly taking notes on everything around him, via the keyboard, so the computer is constantly tracking his interactions in the world. And then he programs the computer with something called a remembrance agent. It works like this — let's say Starner runs into "Kenji" — somebody he only knows a little and hasn't seen in four years. Starner types Kenji's name on his keyboard, and the remembrance agent displays on the screen in front of his eye all the information about Kenji that Starner has ever entered into the system. It displays all that information — as Starner's talking to the guy. What Starner found was that having all that information available to him changed him in certain ways — particularly his social relationships. With easy access to that background information, for example, he'd be able to say stuff like, "Yes, Kenji, I know that last time we talked, your daughter was going to college. How's she doing? What's she majoring in?" Without the computer's help, Starner says, he wouldn't have had those details at the tip of his tongue — he wouldn't even have remembered that Kenji has a daughter. Starner says being able to insert those sorts of details into his conversation changed the way people responded to him — because it conveyed that he cared. "Suddenly," he says, "you're interested in them." These sorts of situations raise intriguing questions — maybe, in this case, it's really the machine that's interested in them. For his part, Starner says he doesn't think relying on the computer in this way cheapened his social interactions. He thinks it deepened them — made him almost superhuman. So in this episode, we look a little deeper into the negative side of how computers are changing us. For example, we talk to this guy named Pete Malachowsky. He started out as somebody sort of like Mr. Rogers — from Mister Rogers' Neighborhood on TV. One thing that famously bothered Mr. Rogers — and Malachowsky, at least in the beginning — was "seeing one person demeaning another." Malachowsky tells us that what really breaks his heart are the daily, minuscule cruelties we all see every day — on subways and buses when, say, a pregnant woman climbs aboard. "You'd think everybody would jump up to give her their seat, right?" says Malachowsky. "But it doesn't happen. It really doesn't happen." Most passengers, he notices in his subway commute in New York, just keep their heads down, and pretend not to see the pregnant woman standing there. So Pete set out to right these wrongs by setting up a Twitter account to document this rude behavior — calling people out on social media. In the beginning, he sort of saw it as a way to restore the moral balance. But Pete says what really happened, over time, is that he ended up becoming the sort of person he hated — his own tweets started to get really, really harsh. 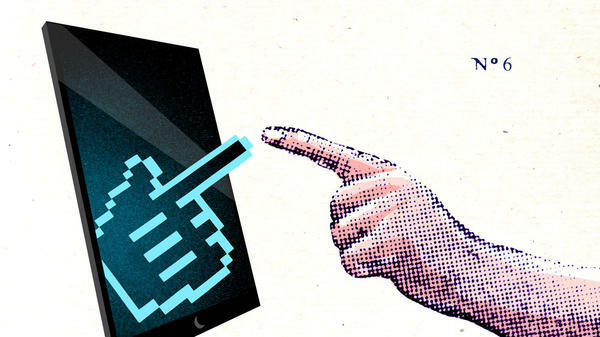 And so we set out to understand in this episode whether there might be something about interacting with a computer — about being online — that could be behind this kind of transformation. And if so, how would that work? What we found out is that there are a whole bunch of psychologists trying to systematically figure out how the rules of socializing work differently online. It's almost as if the Internet is a different planet, where gravity pulls on us in a different way. One really quick example of that is the idea of validation — the feeling you get when you rant to a friend about something that's really bothering you, and then he says, "You know, you're right!" That is almost like a tonic. It cools your overheated system. And the Internet, it turns out, is really good at giving you that feeling. Suddenly you can get validation — not from just one person, but from 30 ... or from thousands. The potency of that is new. And, like any sort of drug, people will do all sorts of things to get it — it can become highly addictive. It's just one way that the social physics of the internet is different from the social physics of real life. It's hard to resist. To hear this season's final episode of NPR's Invisibilia, listen on many public radio stations this weekend or listen to the podcast, available for download at NPR.org and on iTunes. For the past month and a half, NPR's newest program, Invisibilia, has been exploring the invisible forces that shape human behavior, things like thoughts, fear, categories and expectations. This weekend, the show ends its pilot season with a visible twist. Joining me in the studio to talk about it, co-hosts of the program, Alix Spiegel and Lulu Miller. Hello to you both. GREENE: OK. So we said Invisibilia's all about invisible forces. This week you're looking at something different? MILLER: ...Which are very visible. But the way that they affect your behavior isn't always. GREENE: OK. So, Alix, invisible ways that computers affect their behavior. Tell me more. SPIEGEL: Right. So the first person that we decided to talk about this was actually a cyborg. His name is Thad Starner. GREENE: OK. What do you mean by a cyborg exactly? SPIEGEL: So essentially what happened was in 1993, he's in grad school. He goes to see "The Terminator." And in "The Terminator" movie, you know, you have Arnold Schwarzenegger, and he kind of views the world through a screen, which is actually in his eyeball. GREENE: Yeah. It was like weird Google Glass before Google Glass ever came to be. SPIEGEL: Right. So Thad sees that, and he's like that is cool. And Thad goes home and over the course of a bunch of months works with a friend to create a computer that he can wear on his body. And then he jerry-rigs this screen to these goggles so that he has a computer literally sitting in front of his eye. And then he has a keyboard for one hand, and then he programs it so that, you know, he's constantly taking notes on everything around him. GREENE: He's wearing all this stuff as you're talking to him? SPIEGEL: He wears it all the time. He is wearing this. And it is constantly tracking his interactions in the world. And then he programs it with something called the Remembrance Agent, which - let's say you and I have a conversation, and we haven't seen each other in four years. Well, I type your name in and the Remembrance Agent in his eye presents all of the information about you that has ever been entered into the system and gives him information about you as he is talking to you. And what he found is that having that changed his social relationships. And we actually have a clip about that. THAD STARNER: I would have information like, oh, yes, Kenji, I know you're - last time we talked, your daughter was going to college. So how's she doing? What's she majoring in? Would I normally be able to pull up those facts? No. I wouldn't even remember Kenji has a daughter. SPIEGEL: And did that change the way that people responded to you? STARNER: Yeah, of course because suddenly you're interested in them. SPIEGEL: Or maybe the machine is interested in them. You know, there's a question that sort of circles around about computers in circles of people who think about this stuff, which is is a computer unlike any other tool that exists in human history? So is it like a plow or a microscope, tools that humans have created to augment who they are? So the question is, like, is a computer a tool like any other, or is its power to change us so much greater that it is in its own category? MILLER: And the way I think it's fair to say that Thad would answer that question is, yeah. Maybe it really can change us in a profound way. But for him, he found it made him a deeper human in the best of ways. GREENE: The idea of computers really being intertwined in our lives, I mean, aren't there some real negatives, potential negatives to explore? MILLER: Yeah. And Mr. Rogers famously once said if there's one thing that bothers me, it's seeing one person demeaning another. And Pete basically sort of felt the same way. I have a little clip from him. PETE: The whole treat everybody fairly thing, you know, that's like my big thing. MILLER: And one of the places that this most bothered him - the place that he saw sort of the most grave offenses of humanity - was on his daily commute on the New York City subway. PETE: A pregnant woman on the train, you know. You would think everybody would just real quick get up for her. But it doesn't happen. It really doesn't happen. People keep their heads down and pretend they don't see them standing there. MILLER: And these sort of miniscule cruelties would, like, break Pete's heart every day. And so one day, it was 2009. Twitter was sort of recently become mainstream, and he decides he's going to start up a Twitter account, dedicated exclusively to documenting rude behavior on the subway. GREENE: Calling people out on social media. MILLER: Yeah, and it was kind of a new idea at that point, you know. Shaming sites are now a thing. But at that point, it was kind of a new idea. And so he sort of did this as a way of what he felt was sort of restoring the moral balance in the world. If you are rude and you have your feet up on a seat, then you're going to be held accountable. But over time, he sort of changed into exactly the kind of person he originally hated. And the tweets started to get really, really harsh. And so in the hour, we sort of - we talked to him, and we also talked to scientists about are computers behind this change in any way. And if so how? GREENE: Behind the change and turning us into crueler people in a way? MILLER: Yeah. Yeah. You can almost think of the Internet as, like, a foreign planet where gravity moves in a different way and pulls on you in a different way. And so there's all kinds of people trying to just get very systematic about classifying how things pull on you differently and what's different about interacting there. And so we go into some of that. One really quick example is the idea of validation. From the body's perspective, the feeling you get when you go and rant to a friend about something that's bothering you and then they say, you know, David? You're right. That is almost like a tonic. It cools your sort of overheated angered system. GREENE: I'm feeling better just hearing you say that. MILLER: Yeah. You know, you're right. And the Internet is really good at giving you that feeling because suddenly you can get validation not just from one person, but like 30 or thousands. And so the potency is just one thing that's new. And like any sort of drug, people will do all sorts of things to get it and it can become highly addictive. SPIEGEL: So that's like one of the ways that Lulu looks at how the kind of the social physics on the Internet work differently than the social physics of real life where we're all sitting here together talking to each other. GREENE: Well, we're sitting together talking to Alix Spiegel, who is the last voice you heard, and her co-host, Lulu Miller, from NPR's newest program, Invisibilia. Thank you both for coming in. GREENE: And if you have missed the show Invisibilia on your public radio station, you can download all of the episodes at npr.org/podcast or on itunes.com/npr. Transcript provided by NPR, Copyright NPR.